The core members of the design team. From left to right: Dr. Baldur Steingrimsson, Prof. Sung Yi and the PhD candidate Robert Jones. MEDIA CONTACT – Dr. Baldur Steingrimsson at 763-439-6905 or baldur@imagars.com. PORTLAND, Ore. – Sept. 16, 2016 – Imagars LLC, a Portland engineering technology company, has been awarded a $750,000 grant from the highly competitive Small Business Innovation Research (SBIR) Phase II program of the National Science Foundation (NSF) for its Ecosystem for Learning and Team Design. Examples such as these are what drive Dr. Baldur Steingrimsson, President and General Manager of Imagars LLC, and his team to develop a patent-pending tool that can help designers identify design oversights early in the process. Ecosystem for Learning and Team Design is the title for this generic methodology to structured engineering design. This SBIR project is part of a collaborative effort with the Portland State University (PSU) Department of Mechanical and Materials Engineering (MME) and is funded, in part, by the National Science Foundation. The design team consists of Dr. Steingrimsson, originally from Reykjavík, Iceland, Dr. Sung Yi, Professor and Chair of the MME Dept. at PSU, Dr. Faryar Etesami, Associate Professor, and the PhD Candidate Robert Jones. “The Ecosystem has application both for educational institutions and for engineering organizations,” says Dr. Steingrimsson. The educational (Phase I) version has already been put to use by aspiring mechanical engineers in the capstone program at PSU. It has also been applied by engineering departments at the University of Minnesota, the University of Nebraska, and the New Mexico State University. Furthermore, the UC Berkeley Formula Racing team recently asked Imagars to incorporate the team’s Design Decision Document and Design Review Deliverables Document into the Ecosystem. The educational version guides designers throughout the design process, assesses the quality of design activities relative to each stage in the design process, and reinforces proper design techniques. In addition to the design decision support, the Phase I Ecosystem offers numerous project management facilities, interface to development tools (such as SolidWorks), interface with tools for team communications (Google Drive, MS OneDrive, Dropbox), and more. The Phase I Ecosystem is capable of automatically assessing design activities against learning objectives compliant with those set by the Accreditation Board for Engineering and Technology (ABET), as well as exporting design content into formatted project reports. It helps students collect customer feedback, define good customer requirements, translate into strong engineering requirements, and objectively analyze concept design solution candidates. In Phase II, Imagars is looking to extend its structured design methodology to automatic requirement verification, and combine with big data analytics, for the purpose of making use of repositories of know good designs and improving design decision fidelity. 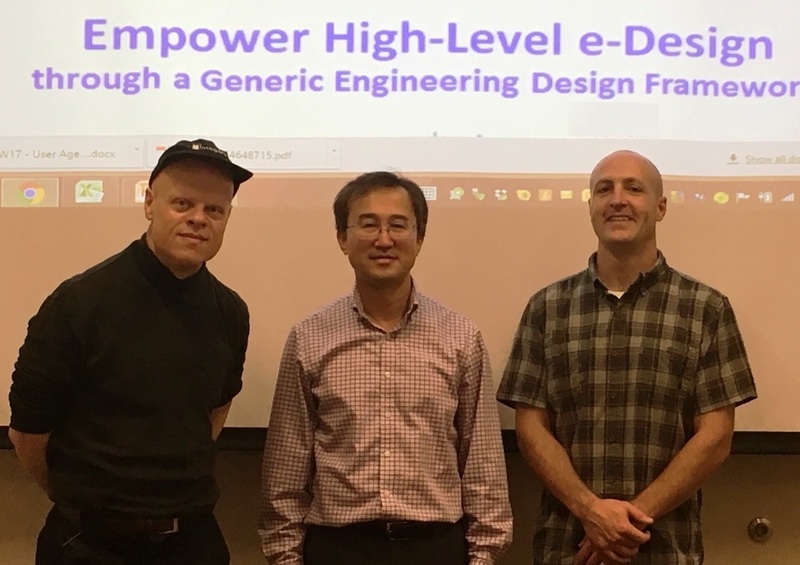 Dr. Steingrimsson believes the generic nature of the automatic requirement verification (Imagars’ e-design assessment engine), and the ability to support development tools across engineering design, has been instrumental in winning over the reviewers at the National Science Foundation. The SBIR program has played a central role in helping Imagars LLC continue with development of the Ecosystem for Learning and Team Design. This is a highly competitive program that encourages domestic small businesses to engage in Federal Research / Research and Development (FR/R&D) of products that have the potential for commercialization. Through a competitive awards-based program, SBIR enables small businesses to explore their technological potential and provides the incentive to profit from its commercialization. By including qualified small businesses in the nation’s R&D arena, high-tech innovation is stimulated and the United States gains entrepreneurial spirit as it fulfills its specific research and development needs.